More than 150 years after about 500 Wendish people came to Texas on a ship called the Ben Nevis, descendants of those immigrants and of others are striving to maintain their culture, customs and heritage. 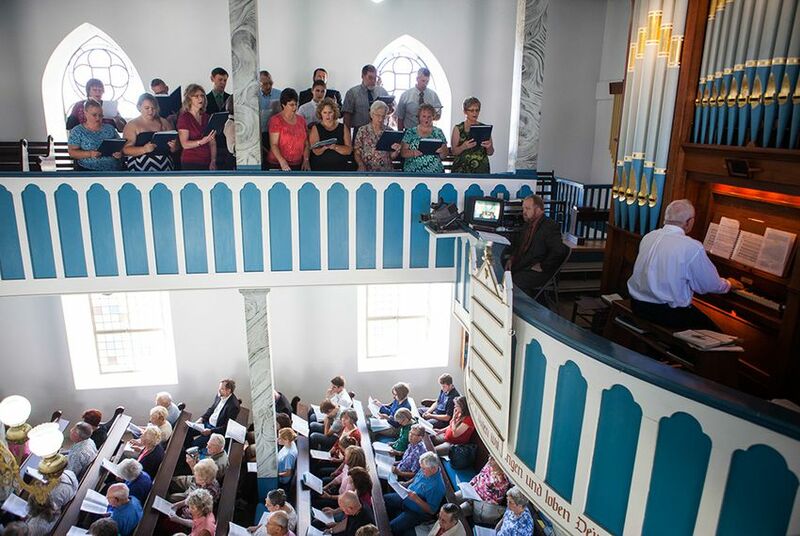 SERBIN — In a light-filled 19th-century Lutheran church with red stenciling above the blue and white balcony, worshipers prayed and sang in German. It was the closest the visitors to this Central Texas community could come to honoring their heritage now that almost no one in Texas knows Wendish, the Slavic language their ancestors spoke in Germany. Every fourth Sunday in September, more than 1,000 Texans travel to the heart of Wendish Texas — Serbin, an unincorporated town 55 miles east of Austin — for Wendish Fest. They attend German and English services at St. Paul Lutheran Church, enjoy a meal of sausage and noodles, and learn about Easter-egg decorating and their own family histories. More than 150 years after about 500 Wendish people came to Texas on a ship called the Ben Nevis, descendants of those immigrants and of others who trickled over to Texas before and after that voyage are striving to maintain their culture, customs and heritage. “We’ve lost the language, we kept the faith, and we’re still working on the culture,” said Weldon Mersiovsky, 64, a retiree in Walburg, north of Austin, and vice president of the Texas Wendish Heritage Society. The Wends, known as Sorbs in Germany, began leaving eastern Germany in the mid-19th century to preserve their language, their Lutheran religion, and a culture rich in folklore and traditions. In Central Texas, where German settlers arrived before the Wends and founded towns like New Braunfels and Fredericksburg, Wends were often absorbed into the German Texan culture. Some Central Texans who grew up in German-speaking families did not realize they were Wendish until adulthood. Others still do not know. Charles Wukasch of Austin, who learned as a teenager that he was Wendish, wants to preserve the customs of his ancestors, but he says doing so is difficult. “We’re trying to keep the culture alive, but it’s sort of a hopeless cause,” said Wukasch, 73, a semi-retired Austin Community College English professor who as an adult learned Wendish, a language related to Polish and Czech that is still spoken in Germany. 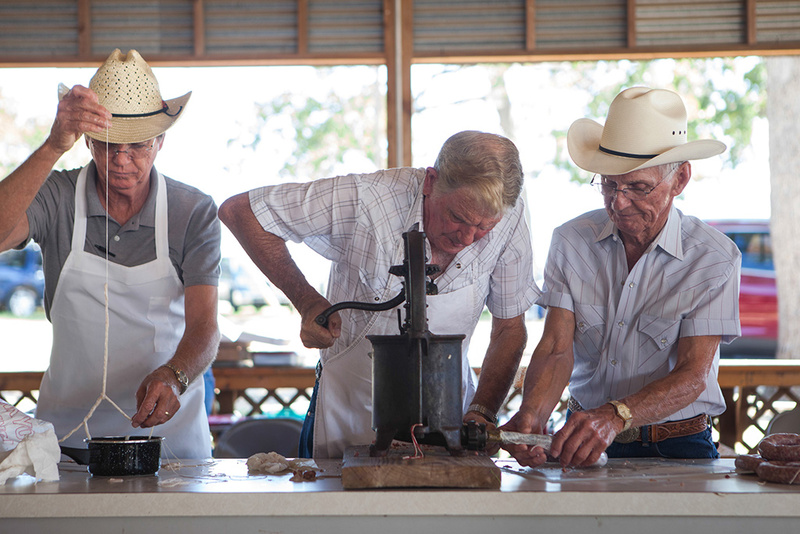 Leeroy Hobratschk, Wayne Chapman and Harvey Hobratschk, left to right, make sausages with a hand-powered press at the Wendish Fest in Serbin, Texas. There does not appear to be an official count of how many Texans are descended from the 1,500 Wends who migrated to Texas between 1848 and 1911, said George Nielsen, a historian who has studied the Wends and is now retired in South Dakota. The largest group of Wendish Texans arrived in Galveston in 1854 on the Ben Nevis from Germany, where Wends had been pressured to speak German instead of Wendish and to join a state-controlled church. They had probably heard good reports from a few Wendish families who had gone to Central Texas. During the harsh journey on the Ben Nevis, dozens of Wends died of cholera. The survivors came to Houston and traveled by oxcart to what is today Lee County. They set up a town they called Serbin and founded St. Paul, the first church in Texas for the Missouri Synod denomination. The Rev. Johann Kilian, an influential pastor who arrived on the Ben Nevis, preached at St. Paul in Wendish, German and English. Although the Wends had come to Texas to preserve the Wendish language, they found German and English useful for doing business in their new country. Serbin flourished during the Civil War, but late in the 19th century, as railroads bypassed the town, it began to decline. Wendish Texans also settled in small towns in Central Texas as well as in Austin, Houston and the Rio Grande Valley. St. Paul still has an active congregation and is a crucial part of Wendish Fest. This year’s event, the 25th annual Wendish Fest, drew more than 1,400 people, organizers said. Near the church is a cemetery where festivalgoers like Dwight Nittsche visited the graves of loved ones — in his case, his grandparents. As Nittsche, 58, walked among the tombstones, a makeshift train pulled by a utility vehicle rolled past the cemetery with children aboard. In a pavilion at the festival, Evelyn Buchhorn demonstrated how her ancestors made Wendish noodles by hand, measuring water for the dough by the half-eggshell. “You couldn’t sell cracked eggs, so what are you going to do? You make noodles,” explained Buchhorn, who wore a button that said Trendish 2 B Wendish. Across the festival grounds in the Texas Wendish Heritage Museum library, visitors like Russell Schwausch, 64, of Austin flipped through binders of records and photos to learn about their genealogy. Schwausch, who said all eight of his great-grandparents were Wendish, has tracked down the names of the ships that brought six of them to the United States. Goeke, who decades ago began recording oral histories of Wendish Texans, is interested in reviving Wendish traditions like the Birds’ Wedding (Ptaci Kwas). One night in late January, in one version of the tradition, children place plates of bread crumbs outdoors and wake up the next morning to find the plates filled with candy and cookies. The sweets are supposedly left by birds that had just celebrated their marriage. Still, he said his own grown children did not have time to invest in Wendish heritage endeavors because “they get caught up in life.” A donor-financed scholarship program encourages young people to become involved with the Texas Wendish Heritage Society. This year’s application asked students to complete an ancestry chart and write an essay about what they imagined it was like for a Wend to immigrate from Germany to Texas. Mersiovsky, guiding the genealogy research at Wendish Fest, organized the Wendish History and Knowledge Extravaganza this year. That event drew about 100 people to Serbin to discuss fine historical points like the nature of Kilian’s leadership. At the festival, Mersiovsky wore a white apron emblazoned with “braschka,” Wendish for a traditional wedding coordinator.